The pros demonstrate what Blizzard's revamped robot can do. Last week was rather eventful for Overwatch. The ‘Bastion Patch’ went live, and a lot of people were quite loud in their disapproval. 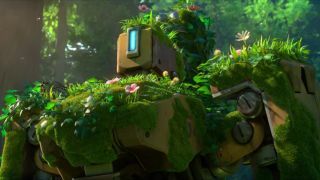 Facebook and Reddit pages were full of angry fans who were adamant that the changes to Bastion were too much. Kaplan sort of agreed, and the new Ironclad ability was toned down within a couple of days. It didn’t do much for the hero’s popularity, as it felt like every single ladder composition included a Bastion regardless of map or point. If you found yourself wondering what impact this had on the esports scene, wonder no more. The fine folks behind Carbon Series chose to run with the patch instead of using a pre-patch tournament realm, giving Complexity Gaming and Team Liquid an opportunity to highlight the pros and cons of Overwatch’s lovable robot. Thanks to his most recent time in the shop, Bastion is now well-rounded enough to be thrown into compositions on both defense and offense. He’s no slouch in Recon mode, and an absolute terror in Sentry mode, eating through Reinhardt shields in the blink of an eye. So, how does a unique character like Bastion fit into the current meta? Well, remember that ‘Transformers Meta’ people were joking about? It was a bit of a thing for Complexity and Liquid. With Mercy pocket-healing a resilient Bastion on the high ground and the payload stuck, Nicolas and DCOP decide to make something happen, jumping down and forcing a couple of ultimates from Liquid. From a tactical perspective, a 50/50 move at that part of King’s Row seems too risky. Bastion is the key to making it feel less shocking for the defense. He’s able to provide a consistent stream of damage while the tanks eat AZK’s ultimate. It isn’t a huge win, but as the teams felt their way through the new pacing, it was as good as they could have hoped for. Does this look familiar to you? Winston and Tracer have to double up with their ultimates to kill Bastion, which opens up the rest of Complexity and destroys their hold. Bastion is the loose thread you’re going to have to pull on in order to see success right now. Here’s where having good game sense comes in handy. After Shadder’s ultimate goes off, Complexity knows Liquid doesn’t have much else to work with and reverse their fortunes with confidence. Mercy has always been popular on the ladder, let’s admit that. So for most of us, her new buff provides added utility to a popular character. We might see her used a little more at the pro level, but those guys need some more time with her in the lab. The changes to Bastion tell a different story. He’s no 76, but Blizzard has made him a decent hitscan option on both offense and defense. It’s doubtful that people will win games in the current meta just because of Bastion, but your average ladder dive comp will struggle chipping through Ironclad just as much as Bastion will struggle staying focused and alive if the attacking team is doing their job. Situations like this reward high levels of skill and execution, making the meta even more interesting than it already was.